A second tunnel boring machine has arrived at Liverpool Street after Victoria broke into the eastern end of the Crossrail station. 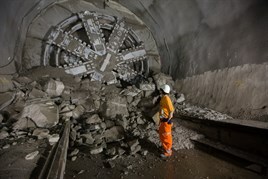 The breakthrough is 40 metres beneath the City of London, and is part of the longest tunnel drive, 8.3km from Limmo Peninsula, near Canning Town, to Farringdon. Victoria joins fellow TBM, Elizabeth, which arrived in January. The second TBM has 750m of tunnel to bore, before arriving at its Farringdon station destination this spring when Crossrail tunnelling will be complete. Liverpool Street is one of ten new Crossrail stations being built in central and south east London. The new station is located between London Underground’s existing Liverpool Street and Moorgate stations, with connections to both.